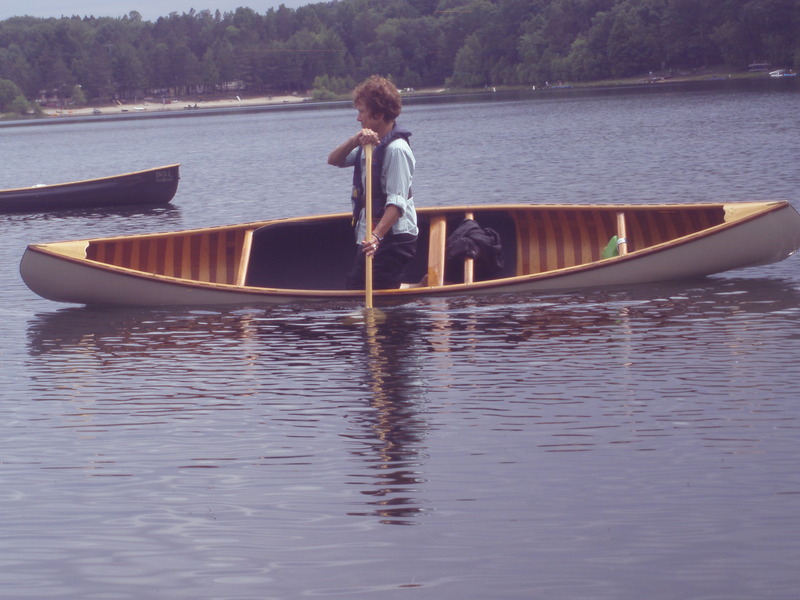 The Wisconsin Canoe Symposium was a great success! More than 30 people attended this event, and a lot of learning happened, for beginners and some pretty seasoned canoeists as well. Beyond that, a lot of friendships were created, and a whole lot of fun was had! This was held at Pine Lake Camp near Westfield, Wisconsin, about an hour’s drive north of Madison. Hotel-style accommodations, bunkhouses, and tent/RV camping were all available. You might think that after 5 hours of instruction on Friday, people might be tired? No… It was time for the Giant Schlalom Race, in which canoeists paddle through a designated slalom course. Penalties for hitting (or missing) gates were… um… ignored. 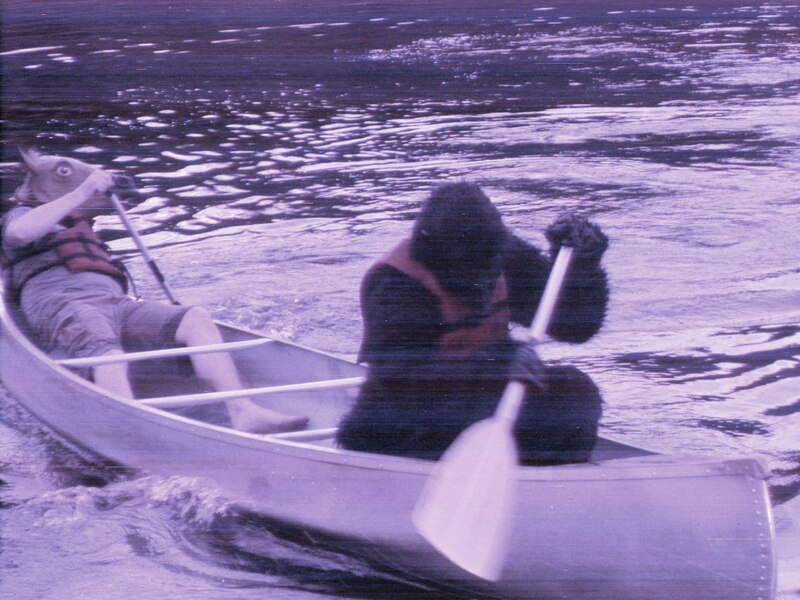 More than fifteen canoes (solo and tandem) competed in this intentionally silly excuse for competition, including a tandem team in costume – one in a gorilla suit, the other in a horse’s head mask. Another tandem team featured PFD Man wearing PFDs all over his body, including one upside down like a diaper! The competition was won by Team Minnesota’s Mike Venero, with Marc Ornstein from New York coming in a close second… The Coveted and Fabulous First Prize was a 4-pack of Sprecher’s Root Beer! OOOOOooohhhhh! After the competition was over, two people took out the camp’s 29-foot “war canoe,” and attempted to run the slalom course. It was tough, but they managed well enough to secure last place. The weather Saturday morning was a bit challenging, with a stiff wind that couldn’t decide which direction to blow. The lake was small enough that we could paddle across to the wind shadows, and instruction could continue. By lunch time, the wind started to settle in, so classes became a bit more focused. One of the Saturday classes was “Creekin’ FreeStyle,” for people who already know a few (or more) FS maneuvers, and want to learn to apply them in moving water situations. The Mecan River provided a grand venue for this — people came back with big smiles! As the daylight faded, the Candlelight Paddling began. Glow Sticks in milk jugs provided colorful “mood lighting” on the water, and battery-operated tea lights, as well as bicycle lights, adorned many canoe decks. Several of the camp’s visitors from another group joined the fun! The Sunday Morning classes wrapped up the event, followed by lunch in the dining hall. Participants were busily exchanging contact info, and asking each other if they were planning to come back next year. Imagine this… the participants were deciding to come back next year, and the organizers still didn’t know if it would happen! 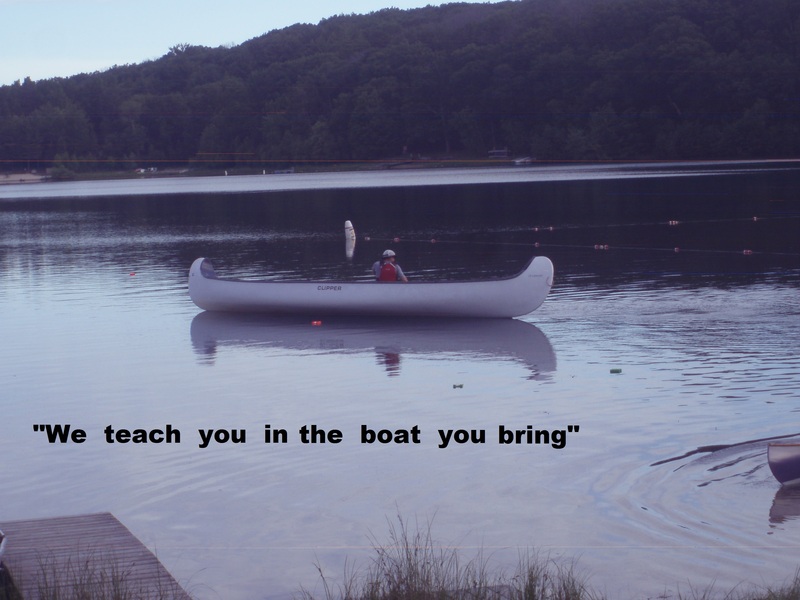 But an after lunch meeting with camp staff settled it — Father’s Day Weekend 2016 will be the next Wisconsin Canoe Symposium!